The cup-shaped flowers of this quick-growing annual from Asia Minor are single, scarlet and delicate. The most neutral and internationally recognized symbol for the allied soldiers that died in the First World War is the poppy. Sow thinly directly in the garden. Do not transplant, but thin out when they emerge. 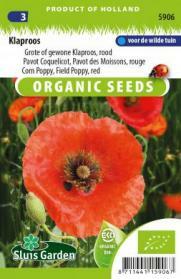 Suitable for flower beds, borders and of course in the wild garden.